In order to achieve one’s goals, you must dream big and believe in those dreams. To that end, I have visited several galleries throughout the years and while enjoying the existing exhibition, envisioned my work on their walls. As the old saying goes…you’ve gotta believe. That was the case with Camera Obscura Gallery in Denver. When I first stopped in a couple of years ago, I didn’t realize at first that the elderly man sweeping the front steps was Hal Gould, an accomplished photographer who was vital to the early recognition of the medium as fine art. He became a respected gallerist for decades featuring the work of Sebastiao Salgado, Paul Strand, Jerry Uelsmann, Imogen Cunningham, and many other masters of photography at Camera Obscura. Would it be presumptuous of me to believe I would share these walls with such great names? I promised myself I would be exhibited here…you’ve gotta believe. I worked hard, I honed my craft and within two years from my first visit they held an open call, and two of my pieces were juried in. I was sharing wall space with some of the all time greats. 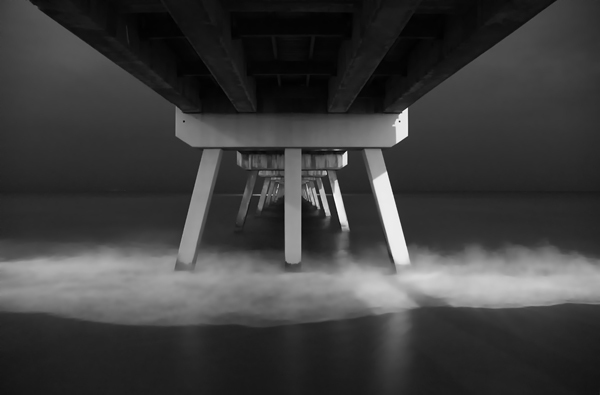 One of those selected images, Under the Boardwalk, is featured above. Created at night while I was positioned under the pier, the biggest challenge was capturing the long exposure to soften the water and then grabbing my tripod and camera before getting soaked from the incoming waves. During that same Colorado trip I had visited another very well respected gallery in Fort Collins, the Center for Fine Art Photography. Once more, I promised myself I would do whatever it took to have my work on these walls. With an outstanding director and staff, C4fap also has the continuous support of many prominent members of the fine art photography community. Again, with a great deal of hard work and persistence, within 18 months of that first visit, I was juried onto those hallowed walls as well. a photographer, Ms. Smithson has been widely published and exhibited nationally in museums and galleries and had her work featured on the cover of PDN just this month. This marks the third time in just more than a year that I have been juried into exhibitions at the Center for Fine Art Photography. This continuing recognition by jurors consisting of prominent gallerists, curators and photographers reinforces my desire to create great work and to always… dream big. This is wonderful! Truly wonderful! Captured in black white and slow speed, so dramatic and classy.